the mind grew more still. on a forgotten cable channel. She said she knew a place with a better address. that bows to me in the heavy rain. muddying my lips on his roots. Since Caimbeul mentioned his 7 year silent retreat, just the idea of S I L E N C E has been in my awareness. What is silence? Where is it found? How does it change us and our experiences? Even just the threat of silence has had life altering force for me. The words thrown out here on this blog are just the reflection of my MIND making stories. 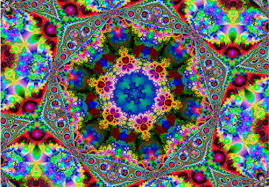 But the images from my own experiences and the experiences of others found in words gives to me at times illumination. Our lives are played out before us like the colors of a kaleidoscope – mixing and blending, forming patterns of ever changing beauty. At the very least, we all watch a cool and mesmorizing show. So as opposed to the monk’s life, which sounds like pure heaven, my life has been full of activity and people. Once, while browsing in a New Age bookstore, I came across a book called The Birthday Book, in which horoscopes (of a sort) were cast for those born on each day of the year. And the forecast for my birthday has stayed in my awareness for years, though I only glanced at the page briefly. My memory tells me that my horoscope said that in my lifetime I would need to release the idea of order and learn to roll with chaos. Did the prediction influence the reality? Or did the prediction reflect a pattern? Or does an idea overlay random events and make them seem to fit in a neat pattern? Silence, of course, is powerful. But learning to find the silence amidst much activity is my practice, pattern, journey, it seems. Even the threat of true silence for an extended period of time turned my life upside down. Here’s how. When my kids were toddlers, I was invited to a talk about Vipasanna Meditation, by S. N. Goenka, who was opening these centers around the country with 10 day silent retreats for free. Oh, how I wanted to go and experience silence for 10 days but it was not the time; I could not leave my children for 10 days, and couldn’t ever imagine a day when this would be possible. But, this idea stayed in my mind, the someday idea, for years. Two years ago, I found out that they had opened a center in Georgia, easy driving distance, and the summer retreat perfectly coincided with my daughter’s sleep away camp. I signed up. This commitment to silence and to my path opened my eyes, changed my life entirely, and I didn’t even get to go. I arranged to leave my older daughter at home with my husband, on the boat we were residing within in a transitory, unpredictable environment that made me suddenly see my life. Though she was 15 and old enough to watch herself with minimal guidance, I saw that our lives had deteriorated to the point that she could not be left in his care. My Eyes Opened to see what was there. I was living in a situation that made no sense, but I couldn’t see what was so close. I had been so busy putting out fires for so long, I hadn’t stopped to realize, I did not wish to be a firefighter. 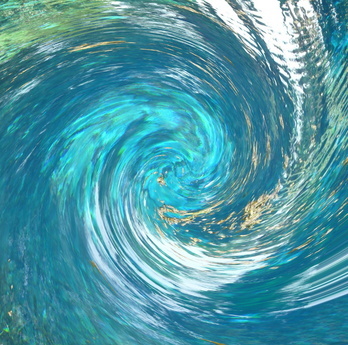 Our created reality of home and family was in a spiral down that I could Stop and Reverse. So began my journey away from the marriage and on to the hard work of recreating a healthy home environment…which is still ongoing! As a bonus for signing up for the retreat, I was gifted a friend who made the amazing commitment to sit with me for a bit every morning of that retreat so that I would know while I was alone, she was with me for that time from her corner wherever that may be. Amazing, right? And this friend was also the sort to offer the gentle yet firm aid in recognizing the shift in my path and offer a different kind of support, on the fly of the ever changing patterns. My unfolding could begin when I answered yes to what the path was demanding of me, and the flow continues on. But one particular thing has struck me about this WordPress experience of the past few months; I don’t know if I can articulate it, but I feel like I am walking the path of many. I am walking the path of healers, I am walking the path of painters and photographers, I am walking the path of silence, I am walking a path of those without the soul contract of children, I am walking the path of those in partnership, I am walking the path of my friends on snowy walks, on other continents, in castles and shanties, and you, perhaps in turn, walk a path with me. All the naked sharing adds to our collective human experience (without boundaries) of what is most real in this realm. I’m starting to realize I don’t have any feelings about the events in my life. In some ways, that sounds just wrong – as if I’ve checked out, gone numb, given up. With the release of expectations or attachments to outcome, things are just happening. I am here, I watch, I do things, and all is equal. Strange, eh? My life up to now has prepared me for the unfolding of now. I stare this now in the face, my own denials, my own attempts to fix, and accept every part. What seems a struggle is when I don’t know what to do, when I imagine I have to make a path or figure something out. What I am learning is how to see the path as I take my step. I step, the path steps up to meet me. Or something like that. The path often doesn’t become clear until I step. The confusion comes if I anticipate the path not meeting me. 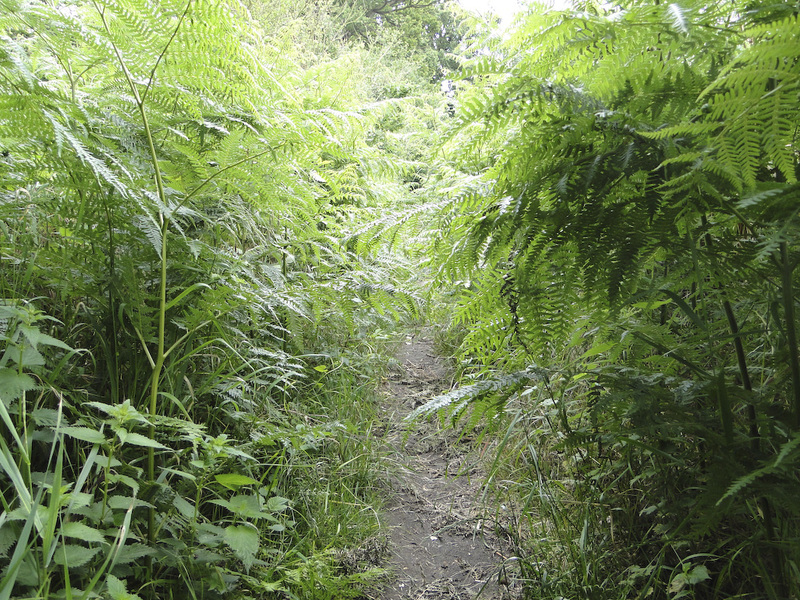 Then the path looks like an overgrown jungle requiring a machete. Now, that old Irish Blessing makes sense, May the Road Rise Up To Meet You. Geez, so silly revisiting all these old sayings and realizing, now I see what that means! I thought I knew, now I see more, and yet there is still more that opens. Without stress, it opens up before me. The Path Will Meet You As You Step. comes from a wise person. prevent it. He hit the man several blows with his club. with many rotten apples on the ground. For hours he whipped the poor man and made him run. the good and the bad, the apples and the snake. “Are you Gabriel? Are you God? and didn’t know it. You’ve given me a new life. Everything I’ve said to you was stupid! you hadn’t eaten, you wouldn’t have vomited. What I thought was one thing, turns out to be another. Turns out I’m not so smart. (grin) I’m right in the middle of another toggle switch moment of realization and change, an oh no, not this! sort of light bulb moment. I wonder why I’m always the last one to know what is going on right under my nose. When I am ready to see, I do. I have ambivalence about writing about this unfolding – in real time – in public. But more and more, the boundaries between me and other seem less and less and my story is yours and yours is mine. So much so that I am not my story, I am not even this IDENTITY, really, though right now I do walk around in this body with the seemingly intense happenings of her now. This now is a chapter that will be revisited in just the time traveling way I talked about yesterday. In this storm of now, I often find myself sitting in the EYE and remaining still, but the force winds are off the charts and the weather forecasters look worried. Even though my reactivity has decreased exponentially, the scenes are still spiraling out of control. I am an observer, a recipient, a rock, an instigator by just existing. My breath, my face, my tapping toe, anything has been fuel for this fire. I did not want to see that it was not normal teenage angst. So here we stand on the cusp of a medical diagnosis – and medication that may help. In some ways more scary than ever – in some ways relief – in some ways just watching the unfolding show. I am trying to stay in the open spot that doesn’t forecast what this means any further than today. I am trying to imagine that anything is possible; I am only responsible for each moment as it comes. I am sort of a straightforward person. Bad brain chemistry makes no sense to me. The sheer illogic of the thoughts and the intelligence and energy of the one in the throws of what I see as incorrect thinking confuse me to no end. I just keep thinking, just stop thinking this. In my marriage I was caught in the snare of another’s thinking for years. I played the role of: THE ONE WHO RIGHTS THE BOAT. It took me years to realize that the boat was being tipped on purpose. The irrational thinking, to me, looks a choice, though I have the doctor’s note that says otherwise. I know I am wrong in this perception, but from my angle, I feel like I see others get to that crazy-making point we all get to and they go right on in, head first. Refusing to stop. Just stop. STOP! I hope the humor will return for all in this house again soon. In many ways, I am continually taking a break to see the big picture. Little me can zoom on out any ol’ time she wants and see that while this may be tough, it isn’t fatal, and even if it were, fatality is inevitable to all of us at some point. So Okay to everything. All is well, even in the storm. Bootstraps pulled up! This is just one little journey with its own set of challenges. I send you love and strength and zoomed out views! And I know you wish me the same. 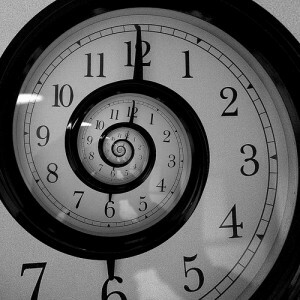 Two kinds of time travel that I know of: the nice kind and the not so nice kind. Up until her pointing for me, the possibility for this sort of travel had never occurred in my awareness. I also realized then that I had been a participant in the Not Nice Kind of Time Travel for a good deal of my life up to that point. The not so nice kind involves imagining yourself as someone “better” in the future. You visit upon that future self with the chores, jobs, obligations that you, yourself in the now, do not wish to do because you see that future self as someone who is together, with loads of time, and strong organization skills to pull it all together better than you. This sort of time travel can occur when you procrastinate now – forcing your later self to stress just in time for a deadline. This kind of time travel can also occur at a sign up list with dates into the future. You sign your future self up for an obligatory task for helping out in a way you, in the now, do not want to do. Oh, you say to yourself, that later self will have plenty of time to be in charge of the class party, volunteer committee, bake a cake responsibility. I’ll let myself in the now off the hook because that future self will have it all going on, by then, surely! That future day used to come and then I found myself looking back at that time-traveling marga and shaking my fist at her. You, I told her, sign up for your own now, for what you are willing to do; don’t sign up your future self in this way. This is being your own worst enemy. The nice kind of time travel my friend introduced me to is actually much more earth shaking than what I just described. This type of trip is a powerful tool and paradigm shifting way of viewing your life and your reach, stretching the hand of love across space and time to the worthy recipient of yourself. Let me see if I can explain. This travel is a back visit to your earlier self in painful, scary, pivotal times when you truly wondered if you would survive. And since you know that you do survive into this future self in the now, you can go back and visit yourself, bringing the love, support and knowledge you wished for in the painful moment, with the full assurity this future self can only give. When I first experimented with this, I thought of just the times to visit, immediately, and even remembered feeling the inexplicable wash of love that had come over me sometimes in my past. We often think of guides and spirits being with us, but how interesting it can be to realize we just may be visiting our own selves, as well. And really, if you dwell creatively here for a moment, the realization hits, that this is just the very beginning of all sorts of traveling possibilities.